Representatives of the Commonwealth of Independent States, a confederation of former Soviet republics, visited the Skolkovo innovation centre on Wednesday, where they discussed cooperation in the fields of renewable energy and energy-saving technologies. Imomuddin Sattorov, Tajik Ambassador to Russia and chairman of the economic issues commission. Photo: Sk.ru. 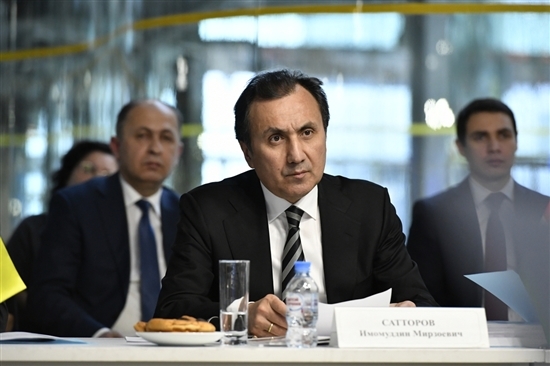 The discussion took place during a meeting of the economic issues commission of the CIS Economic Council, which was held at the Skolkovo Technopark and attended by representatives of Armenia, Azerbaijan, Belarus, Kazakhstan, Kyrgyzstan, Moldova, Russia, Tajikistan, Turkmenistan and Ukraine. Participants also discussed the possibility of increasing cooperation in the fields of food safety, the transit of cargo between CIS member states, and environmental protection. Imomuddin Sattorov, Tajikistan’s ambassador to Russia and chairman of the economic issues commission, said at the meeting that the commission’s priorities in the near future should be strengthening cooperation in the fields of energy, industry, transport and communications. Skolkovo vice president for regional and international development, Yury Saprykin. Photo: Sk.ru. “In the energy sphere, the key task will be boosting efforts to cooperate in the area of energy-saving technologies and the renewal of energy systems in CIS member states,” said Sattorov. “We will also work on the use of renewable energy resources. In the field of agriculture, particular attention will be paid to cooperation in ensuring food safety,” he added. Skolkovo is an active player in the state programme to develop innovations throughout the territory of the CIS, said Yury Saprykin, the Skolkovo Foundation’s vice president for regional and international development. “Our primary aim is to provide an integrated process and collaboration between projects with similar research areas throughout the commonwealth,” said Saprykin. “Our second task is to help Skolkovo Foundation resident companies find new markets. We are constantly working on these two missions,” he added. Several resident startups presented their work to the CIS delegation. The delegates learned about the work of YUNIM, which has developed a cloud platform for analysing tumours in cancer patients; DRD, which has developed an express blood test for diagnosing strokes; YaKlass, an educational platform for teachers, pupils and their parents; GlobalLab, an online community for carrying out joint scientific projects; and TermoElectrika, technology for the real-time monitoring of the temperature of power grids.